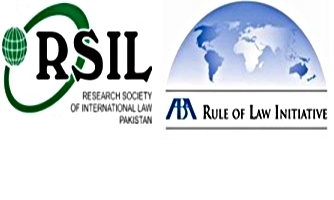 The Research Society of International Law (RSIL) in collaboration with the American Bar Association (ABA) Rule of Law Initiative is holding a full day workshop on ‘Pakistan’s Anti-Terrorism Legal Framework and Human Rights’. All interested participants may contact Mr. Fahd Qaisrani at: fahd.qaisrani@rsilpak.org by 4th October, 2016 latest. Day-long event from 10:30 AM to 5:00 PM. Lunch and refreshments included. All participants who attend the event shall receive a Certificate of Completion from the ABA and RSIL. The event is a capacity-building initiative and will be free-of-charge for interested participants. However, RSIL reserves the right to admission due to seating limitations.